Major participants active in the global anti-snoring device and snoring surgery market comprise Apnea Sciences Corporation, Sleeping Well, LLC, Somnomed Limited, The Pure Sleep Company, Theravent, Inc., Airway Management Inc., GlaxoSmithKline, PLC, Tomed Dr. Toussaint GmbH, and Meditas Ltd. These players are claimed to boost the development of the anti-snoring device and snoring surgery market. 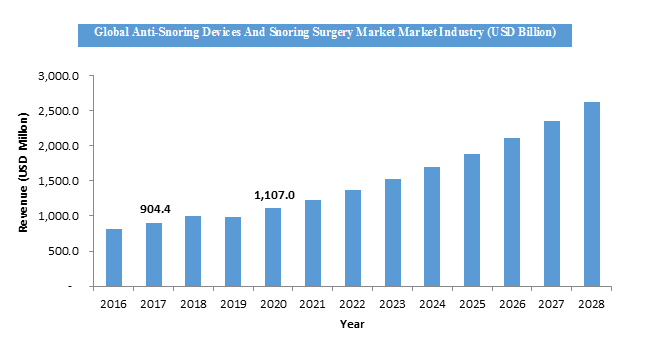 As per analysts at Zion Market Research, the global anti-snoring device and snoring surgery market added up for USD 814.2 Million in 2016 and is likely to cross almost USD 1522.9 Million by end of 2022, developing at a CAGR of almost 11.0% from 2016 to 2022. “The global anti-snoring device and snoring surgery market are likely to undergo the highest development in the years to come due to increased awareness in developed nations of Europe and North America about the side effects caused by snoring and advantages of associated therapies,” claim analysts at Zion Market Research. Moreover, recent elevation in alcohol consumption and cigarette smoking is the major reason to boost the development of the anti-snoring device and snoring surgery market. Furthermore, increasing obese and geriatric population is also one of the reasons that are directly accountable for powering the development of the anti-snoring device and snoring surgery market. Apart from this, technological enhancements in anti-snoring devices will possibly elevate the requirement for the anti-snoring device and snoring surgery market. On the flip side, the high price of anti-snoring devices and snoring surgery might hamper the development of the anti-snoring device and snoring surgery market. Even so, the untapped market of developing nations from Africa and the Asia Pacific is believed as major avenues for the development of the global anti-snoring device and snoring surgery market. In addition to this, supportive government initiatives are also set to boost the growth of the anti-snoring device and snoring surgery market. For instance, in Feb 2018, the CFDSM (Center for Craniofacial & Dental Sleep Medicine) got approval from the FDA for OSA (obstructive sleep apnea) and snoring appliance (named as the Meridian PM oral appliance). Area-wise, in 2016 North America was the dominating area for the anti-snoring device and snoring surgery market in terms of income owing to the development of innovative anti-snoring gadgets in the healthcare sector. Moreover, the rise in the number of aged population in Europe and North America serves as a major boosting factor for the development of the anti-snoring device and snoring surgery market. Furthermore, anti-snoring device and snoring surgery market have the great growth avenues in emerging nations of Asia Pacific owing to the increase the disposable revenue of people and elevation in awareness.